Today, you can find air conditioners in almost every home today. However, there are a lot of people who have an air purifier. Do you know that there are some comparisons between air purifier and air conditioners? Yes, each of these products have their differences. 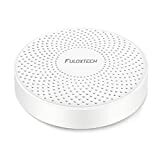 Nevertheless, you will find an answer to the questions you have been asking yourself about air purifiers and air conditioners. You will learn how each device works, and understand their benefit when used in your home. Hopefully, by the end of this article, you will also know which device will work best for you. In short explanation, an air conditioner draws hot air out of your room while giving you cold air in return. However, most advanced air conditioners can blow both hot and cold air. On the other hand, the duty of an air purifier is far different from that of an air conditioner. These systems are in charge of removing air contaminants and particles from your home. Air Purifier Vs. Air Conditioner: Which One Is Best for Your Home? Application • Takes care of indoor air by getting rid of airborne particles, smoke, allergies, odor, and other contaminants. • To reduce humidity and indoor temperature level. Benefits • It is beneficial to allergy and asthmatic sufferers. • Makes the indoor air conducive for breathing. Sometimes it could also help to purify the air to relief those with breathing problems. Removal • Pet dander, mold spores, allergen, dust, bacteria, and other airborne contaminants. • Temperature, and Humidity. Air purifiers can’t pump cold or hot air to your home. Rather, it improves the indoor air by filtering particles and other common household contaminants. We all know that airborne substances such as dust, pollen, and bacteria are very harmful. An air purifier helps to get rid of all these harmful substances, thereby preventing respiratory diseases in the process. Although few advanced air conditioner unit has a slight air purifying abilities, they still work differently from an air purifier. These systems adjust the temperature of your home or office to make you comfortable. It draws out heat from your room and pumps out cold air in return. Although the air conditioner filters might trap pollens, dust, and dander, it only prevents these particles from damaging its system. air conditioner are the best choice if you have a breathing problem like allergies, asthma or COPD. This device is also best preferred when the amount of pollen or dust inside your home needs to be reduced. On the other hand, an air conditioner might be the best pick when you want to have a comfortable temperature. These units are best used to control the indoor temperature. They are also the perfect choice if you’re going to reduce high humidity level in your home. Before going any further, you need to know all about MERV rating. MERV means “Minimum Efficiency Reporting Value”. This is the rating system that defines the effectiveness of an air conditioner filter. The effectiveness of an AC filter depends on the MERV rating. When the MERV rating is too high, you won’t feel any air. Homeowners should use an AC with a maximum of 11-16 MERV ratings. However, the MERV rating channels its attention on how dust and other particles are later removed through an air filter. Therefore, air purifiers need a higher MERV filter rating to collect more airborne allergens including dust and pollens. Below are the types of Air conditioner filters. 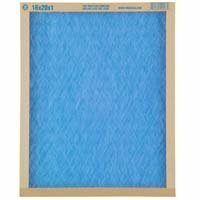 These filters have a low MERV rating of 1-4 and can get rid of less than 10% airborne particles. The downside is the fact that they aren’t effective to trap debris out of the air. However, they are very affordable when compared to the other types. This filter has a shape like an accordion which enables them to catch a lot of tiny particles. They have a MERV rating of 10-13 and pretty expensive when compared to other air filters. They can remove less than 45% of the airborne pollutant from your indoor air. You can get it around $10. These filters are the main deal when it comes to the removal of debris in your home. With a MERV rating of 14-16, they can trap up to 85% of airborne pollutant that passes through it. Although they are pricey, they work great to relieve breathing problems such as allergies and asthma. HEPA, which stands for “High-Efficiency Particulate Air” works great with your air conditioner. However, this isn’t the best AC filter for those with allergies. The reason is that HEPA air filters are too effective. The mesh disallows the free flow of air, and this could hurt the AC unit in the long run. When it comes to washable filter, you can reuse these filters some times. However, they have a very low MERV rating of 1-4 and this makes it pretty hard for them to remove debris. Allowing these filters to stay dirty is a smart idea, as they rely on built-up debris to prevent other debris forms. Made from cotton, foam, and fiberglass, this traps airborne pollens and dust that pass through either a free-standing model. You will need to replace the filter monthly as it traps a lot of particles. HEPA filters stand has the most effective air purifier filter. Ensure you check the MERV rating of your air filter to know its strength. 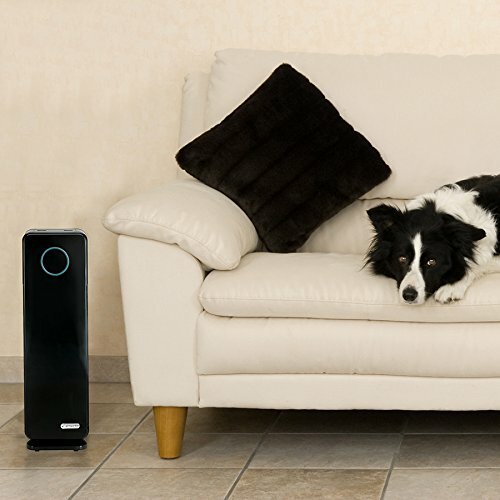 With little differences, ionizers and ozone types work great to remove air pollutants! They produce two charges (ions and ozone), that neutralizes harmful substances in the air. Most airborne particles comprise of neutral charges. These particles react with the released ion and ozone from the air purifier, making them become heavy and fall to the ground or sometimes stick to any surfaces. However, for those that have a breathing problem, it is advice you shouldn’t use these filters in your home. Just like the ion as mentioned above and ozone types, electrostatic filters also charge air floating particles. They work by collecting particles within the machine. 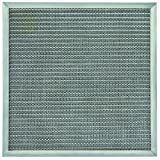 These filters are effective in killing all types of air contaminants such as bacteria, molds and more. The electrostatic filter also produces ozone which might be harmful to with breathing problems. An activated carbon filter contains porous carbon. 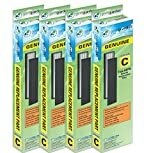 These activated carbon filters remove odor and gas from the air. If your air filter isn’t taking care of the smells, then activated carbon filters have to come into play. These are the best filters when it comes to germs. With ultraviolet light, it can handle all microbes and harmful particles in your home. You can install the UV lights also within your HVAC system to treat the air. You can also fit them around the air handler to improve the indoor air quality. 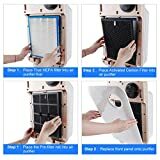 Can Air Purifiers Be Used With Air Conditioners? Yes! Using both units in your home is safe. This way, the cool air from the air conditioner will get cleaned by the air purifier. With this said, you probably now have a clearer insight about air purifiers and air conditioners. You must have also learned about the differences and similarities between both systems and their filters. We hope that this article will be of great help to you in your dealings with both units.